This is an unpopular opinion, but February is one of my favorite months. For one, it's my birthday month! Some of my friends also have birthdays in February so I love going out and celebrating on the weekends. The weather also starts to get warmer, even if it's just a few degrees it feels like a big difference when you have to walk all across campus! 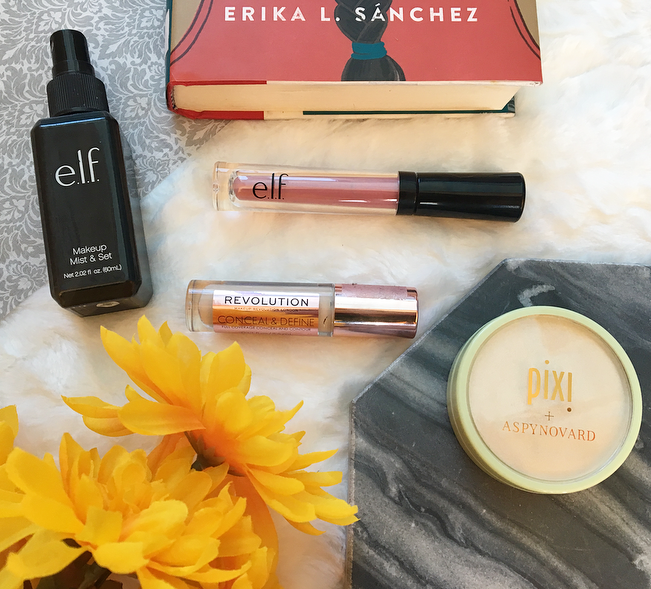 This month I have a lot of affordable makeup favorites as well as the usual TV/reading favorites! So many highlighters that are suited for fair skin are a pale pink, so I love finding one that is a really light gold like this one! It feels weird to swatch, almost moussey like the Colourpop highlighters, but it picks up like a powder with a brush and it looks stunning as a highlight. 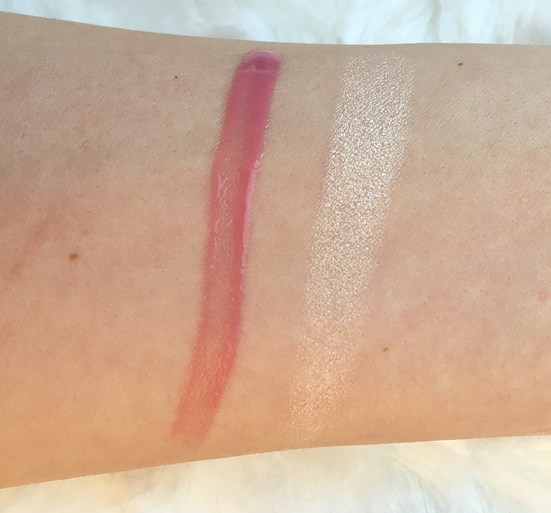 If you like Moonstone from Becca I think you would love this shade! I compared this to the Tarte Shape Tape concealer and for me, this one comes out on top! It blends into the skin beautifully, has good coverage, and looks natural on the skin but covers everything I want to cover. Since adding this to my Project Pan I've gotten a lot more use of of this product and I've found a love for setting sprays! I don't usually have an issue with my makeup lasting all day, but I definitely struggle with a powdery, dry look after I finish setting my face. Setting spray helps take the powderiness away. I picked this up on a whim because I'm loving lip gloss at the moment, and this formula is fantastic! If you hate sticky, heavy glosses you may want to try this out. It feels hydrating and gives a little color. I haven't seen a lot of superhero movies, but this R-rated one was so funny! I loved it. Ryan Reynolds was amazing and I like how it broke the fourth wall constantly. I understand why a lot of my old coworkers were raving about it now. It's about a man who wants to get revenge on the people who disfigured him and transformed him into an immortal superhero, but he isn't exactly the superhero type. Another popular one, I'm finally joining the hype for this HBO series. I still have a few episodes to go, but I'm flying through it! It stars Reese Witherspoon, Nicole Kidman, Shailene Woodley, and some other big names. It's hard to explain what it is about because I haven't reached the end of the series, but I think that someone gets murdered at a school party. I can't wait to read the book! Did anyone else know that there was a travel channel? I had no idea until I heard about this show and fell in love with it! I'm a big mystery/mythology/history nerd and a show like this is perfect for me. It follows Josh Gates, an archaeologist and presenter, as he explores ancient mysteries around the world such as what really happened to Amelia Earhart's plane, where the missing Amber Room is, and if there ever was a lost city of gold. I'm adding a lot of places to my travel list since starting to watch this show! Unfortunately, it's hard to find but it may still be on Netflix in some countries. I'm taking a Young Adult Literature course this semester and as you can imagine, it involves a lot of reading. So far this story is my favorite. It's about a teenage girl named Julia who loses her sister and after her death she tries to uncover some of her sister's secrets. I really loved the main character, she was an unusual female protagonist. I rated this one 4/5 stars on Goodreads. I would love to hear what your favorites are this month! 16 comments on "February Favorites"
I've been hearing so many good things about the Makeup Revolution concealer lately, I need to try it out soon. Need to start watching Big Little Lies, it looks so good! Deadpool is hilarious! The elf lip oil has such a pretty shade! The Makeup Revolution Concealer is so high up on my list at the moment, I am going to have to try it out very soon! I want to try the Makeup Revolution concealer too, I read great reviews about it and everyone seems to love it! I've heard so many good things about the MUR concealer! I recently picked up the Makeup Revolution concealer and I absolutely love it. it does everything I need it to. the ELF lipgloss looks like a lovely shade!